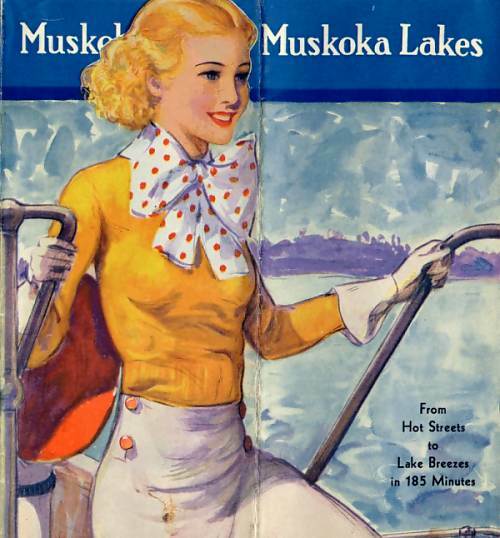 Today Muskoka is a thriving vacation, small business and early retirement centre - visit the Gravenhurst Business Directory 1938 and the Bracebridge Business Directory 1936. As picturesque as it in the beginning, it has become a haven not only for world weary nature lovers but also for small businessmen who with modern technology are able to work from their homes and artisan workshops spanning the distance to large urban centres with computer internet lines and E-mail. Recreation and tourism are the foundation of many of the businesses and services of Muskoka. And these are rapidly expanding with recently announced plans to develop the area as the Golf Capital of Ontario. The Muskoka Tourism Department and the very active local Chambers of Commerce are successfully extending what used to be a summer vacation land into a year round recreation area of snowmobiling, cross country and downhill skiing and walking trails, while carefully preserving the natural beauty and unique Muskoka character. About 20 minutes to the south of Muskoka is the world class Rama Gambling Casino which in addition to gaming, features world famous singers and musicians. The list of music and art festivals in each part of Muskoka is endless. And to the north is the unspoiled wilderness of the vast provincial preserve, Algonquin Park whose beauty is the timeless subject of famous artists and artisans. Tourism began almost by chance in the early pioneer days. 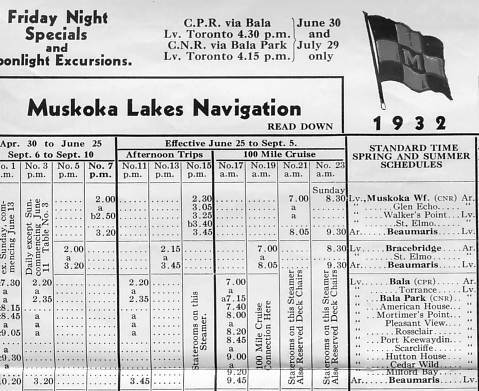 As more and more tourists found their way to Muskoka local residents recognized the potential and started to make money by housing lodgers that were delivered by many of the Muskoka Navigation Company steamships, the Wenonah, the Nippissing, the Sagamo and the Segwun. Early pioneers began to take in lodgers and some of the more astute landowners realized that there was tourist gold at their doorstep. 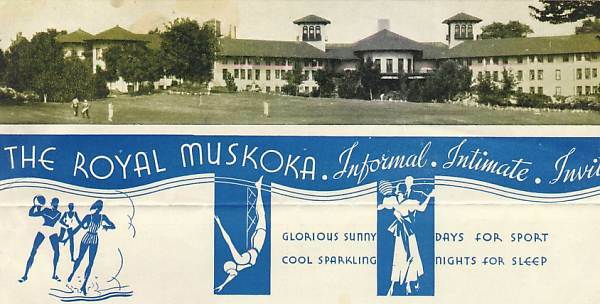 Lavish hotels like the Royal Muskoka, the Windermere and Elgin Houses and Bigwin Inn on Lake of Bays began to attract the very wealthy from North America and Europe, creating seasonal employment for local residents. As visitors seized the opportunity to buy their own piece of Muskoka the local people became the builders and guardians of the lake and island properties. They also became the storekeepers for the new cottage industry. Lords and Ladies summered in Muskoka. American President Woodrow Wilson had a place. When World War I was declared Canadian Prime Minister Sir Robert Borden had to be summoned from vacation at the Royal Muskoka. Sir John and Lady Eaton built a magnificent summer estate which is now Rosseau College an exclusive private school. Lady Eaton's private launch The Wanda has been restored and can be seen taking private parties on cruises of the Muskoka Rivers and lakes. 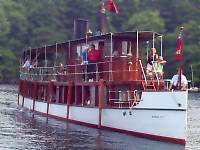 The stately steamer the Segwun once a mail and passenger ship for the Muskoka Lakes, has been restored and regularly sails from Segwun Bay in Gravenhurst this time for pleasure and sightseeing cruises. Three times a day the big white Lady Muskoka travels from Bracebridge down the Muskoka River to Lake Muskoka and along Millionaires Row all within picture taking distance of the beautiful old Muskoka mansions and boathouses. Orville Wright, one of the famous American brothers who invented the airplane had his cottage in the Georgian Bay part of Muskoka. Orville would have been delighted to see the many small planes landing on the network of lakes and rivers. Muskoka has its own small airport now and convenient shuttle service to the big International Airport in Toronto. Muskoka has been dubbed Hollywood North as various Hollywood stars and sports heros build their retreats. Local residents report occasional sightings of Goldie Hawn and Kurt Russell, Martin Short, Steven Speilberg and Tom Hanks. A boon to the larger towns of Muskoka are the growing number of active early retirees who are selecting these towns to live in as they dispose of their large city homes and seek the peace of a country setting within a few hours of city life. Today the seasonal property owners are moving to winterize their properties as it becomes apparent that life in Muskoka no longer ends at Thanksgiving but is transformed by a new beauty and solitude in the winter and spring. As permanent residents already know Muskoka has four distinct seasons, all breathtakingly unique. Muskoka Information © 1998-2003 Baytides Management Inc.